Turn left at Greenland. Carnegie Hall. He's very clean, isn't he? You've got to hide your love away. Rubber Soul. Bigger than Jesus. LSD. Let me take you down. Sgt. Pepper. All you need is love. The maharishi. Yoko and Linda. The rooftop concert. You never give me your money. Paul is dead. April 1970. Let It Be. 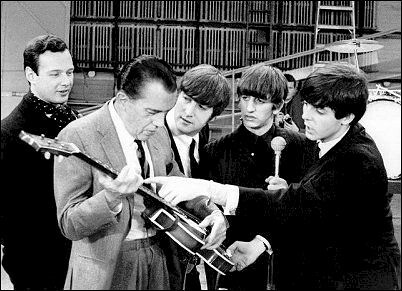 The Beatles were heading for New York for an appearance on The Ed Sullivan Show, followed by a handful of concert dates. Then they'd go back home. Photographer Robert Freeman, who took the cover photos for every Beatles album from With the Beatles to Rubber Soul, was on the plane. He remembers them as cool, cracking jokes. "They weren't nervous. It was just another thing to deal with," he said. Yes, the group had the No. 1 U.S. single -- I Want to Hold Your Hand. Yes, John Lennon, Paul McCartney, George Harrison and Ringo Starr were vaguely aware that Beatlemania -- which had overtaken Britain and much of Europe -- was showing signs of erupting in the United States. 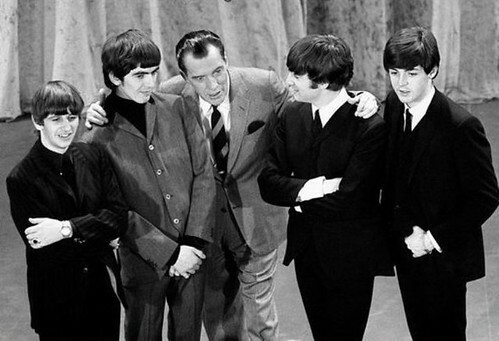 Manager Brian Epstein and The Beatles with Ed Sullivan. "[Harrison] mentioned all the big American stars who'd come across to Britain," recalled a reporter for the Beatles' hometown paper, the Liverpool Echo, in Philip Norman's biography Shout! The Beatles in Their Generation. "He'd been across [to the States], unlike the others; he knew what the place was like. Maybe it was just talent. Martin Goldsmith, author of the recent The Beatles Come to America (Wiley), said he believes the band would have swept the United States even if Kennedy hadn't been assassinated. "Lennon and McCartney were superb composers -- their songs were brilliant and remain brilliant," he observes. 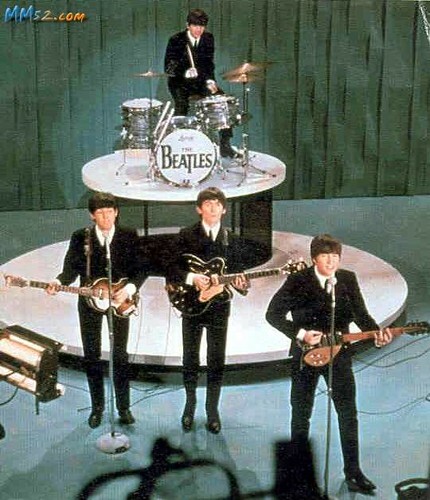 The Beatles appeared on the Ed Sullivan show on three consecutive Sundays in February, 1964. Their first appearance on February 9 is considered a milestone in American pop culture and the beginning of the British Invasion in music. The broadcast drew an estimated 73 million viewers, at the time a record for an American television program. He starts singing I Want to Hold Your Hand, with its phrases dipping down the musical scale -- Oh yeah I'll/Tell you something/I think you'll understand/When I'll/Say that something -- and then jumping an octave -- I want to hold your HAAAANDDD! Maybe it was just money and media. Capitol Records, which had rejected three Beatles singles in 1963 (the songs, released on other labels, bombed miserably), poured $50,000 into a promotional campaign. Celebrities wore Beatle wigs. An amused Jack Paar played a clip of the Beatles on his talk show. The Beatles Are Coming stickers were everywhere. The Beatles and Manager Brian Epstein and Neil Aspinall in background. The Sullivan show remains one of the highest-rated non-sports programs of all time. Nielsen estimates 45 percent of the country watched the show -- more than 73 million people then. Apocryphal tales maintain that not a single crime was committed in New York during the Sullivan hour. In his satiric, semi-fictional Beatles biography Paperback Writer, author Mark Shipper -- playing fast and loose with the facts -- invented a debut album for the group. "We're Gonna Change the Face of Pop Music Forever," it was titled. But think: Sullivan cemented its stature as the place to see the latest rock 'n' roll acts. Bernstein went on to promote the Beatles' 1965 and 1966 landmark Shea Stadium concerts; he later offered $100 million for a 1976 reunion show. 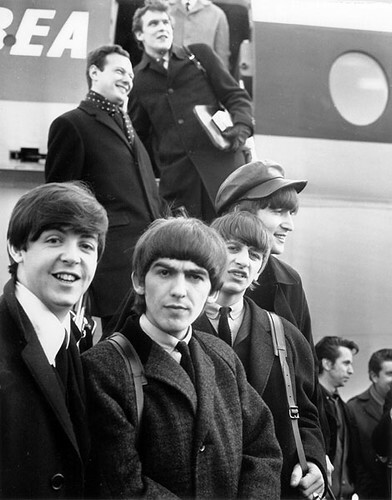 In late 1963, Mr. Sullivan found himself among a throng of 15,000 excited kids at Heathrow Airport in London who were there to see a young British recording group, The Beatles. Sullivan was intrigued. In December 1963, Beatles manager Brian Epstein arranged for the group, still relatively unknown in the United States, to appear three times on the show at $4000 per appearance. Epstein was then able to convince Capitol Records to mount a publicity campaign for the Beatles arrival, and to release I Want to Hold Your Hand. The Beatles appeared on three consecutive Sundays in February, 1964, to great anticipation and fanfare as I Want to Hold Your Hand had swiftly risen to #1 in the charts. Their first appearance on February 9 is considered a milestone in American pop culture and the beginning of the British Invasion in music. The broadcast drew an estimated 73 million viewers, at the time a record for an American television program, and was characterized by an audience composed largely of screaming teenage girls in tears. The Beatles followed Ed's show opening intro, performing All My Loving, Till There Was You (featuring the Beatles names imposed on the screen and the famous "SORRY GIRLS, HE'S MARRIED" caption under John), and She Loves You. Then, late in the hour, they returned to perform I Saw Her Standing There and I Want to Hold Your Hand. 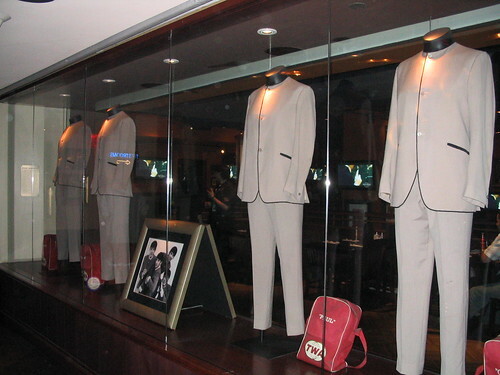 The Ed Sullivan Show Beatles' outfits. The Beatles returned to the show, this time broadcast from Miami Beach, on February 16. A crush of people nearly prevented the boys from making it on stage in time. A wedge of policemen was needed, and the band began playing She Loves You only seconds after reaching their instruments. They continued with This Boy, and All My Loving, and returned later to close the show with I Saw Her Standing There and I Want to Hold Your Hand. They were shown on tape February 23 (this appearance had been taped earlier in the day on February 9 before their first live appearance). They followed Ed's intro with Twist and Shout and Please Please Me and closed the show once again with I Want to Hold Your Hand. The Beatles appeared for the final time on September 12, 1965 and earned Sullivan a 60 percent share of the nighttime audience for one of the appearances. This time, they followed three acts before coming out to perform I Feel Fine, I'm Down and Act Naturally, then closed the show with Ticket to Ride, Yesterday and Help!. 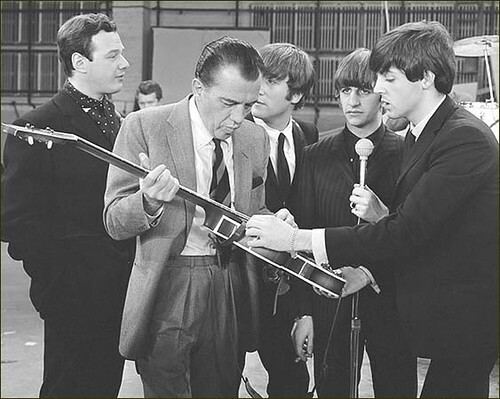 Although this was their final live appearance on the show, the group would for several years provide filmed promotional clips of songs to air exclusively on Sullivan's program. Such as in 1966 and 1967 airing clips of Paperback Writer, Rain, Penny Lane, and Strawberry Fields Forever. The Beatles perform "Til There Was You." This video is from the Prince of Wales Theater on November 4, 1963. The Beatles perform "She Loves You." This color video was taken in November 1963 in Manchester, England.